Our concert at Henleaze on Saturday 10th March will feature Sea Sketches for string orchestra by Welsh composer Grace Williams. Click here for concert details. Grace Mary Williams was born in February 1906 in the coastal town of Barry, South Wales. Both of her parents were schoolteachers who loved music, and they had a large collection of gramophone records and piano scores, which the children were encouraged to explore. Her father William directed the Romilly Boys Choir, and young Grace often played the piano for choir rehearsals. At home, she played the violin in a trio with her father on piano and her younger brother Glyn on cello. Grace began composing music while still at school, often going to sit on the beach at Cold Knap in Barry to write songs and dances. The sea would be a lifelong influence on her music. She claimed that one of her early inspirations had been hearing, aged 14, a performance of Morfa Rhuddlan by another Welsh woman composer Morfydd Owen – who died tragically young in 1918 aged just 26. It was the newly established Morfydd Owen Musical Scholarship which then enabled Grace to take a place at University College Cardiff in 1923. 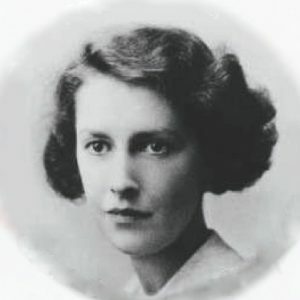 After graduating from Cardiff, Grace went to the Royal College of Music where she studied composition with Ralph Vaughan Williams and became friends with what turned out to be a particularly gifted group of women composers – Dorothy Gow, Imogen Holst, and especially Elizabeth Maconchy, who remained a lifelong close friend. After the RCM, Grace (and Maconchy) studied in Vienna for a year, taking every opportunity to visit the opera and to soak up the city’s music and culture. Returning to London in 1931, Grace took a couple of part time teaching jobs. Some of her compositions were beginning to be performed and broadcast, and it was around this time that she developed a friendship with Benjamin Britten. The pair would discuss each other’s works, and went to the opera and cinema together. She was evacuated to Grantham in Lincolnshire early in the war, but later returned to Hampstead, where in 1944 she wrote Sea Sketches – a moody and evocative work for string orchestra that she dedicated to her parents. The five movements (‘High Wind’, ‘Sailing Song’, ‘Channel Sirens’, ‘Breakers’ and ‘Calm Sea in Summer’) display bold colours and driving rhythms and were inspired by memories of the sea on her beloved Glamorganshire coast. The following year she wrote “I don’t want to stay in London – I just long to get home and live in comfort by the sea”. The stress of teaching and composing made her depressed and quite ill for a couple of years, and she even considered giving up composition. In 1947, aged 41, she returned to a self-contained flat in her parents’ house – and would remain in Barry for the rest of her life. The move back home provided the change that Grace needed, and over the next few years she established herself as a successful freelance composer, working for the BBC on arrangements and incidental music for its educational programmes and other TV and radio series, teaching composition at the College of Music and Drama in Cardiff, and increasingly taking commissions from major orchestras, festivals and Eisteddfods, and from the BBC. Her musical style developed away from the romantic textures of her earlier works towards a more individual language, although she continued to focus on vocal and orchestral works. She stopped referring directly to Welsh folk tunes in her music, but Welsh music and literature remained an important influence. She wrote two symphonies, three concertos, a comic opera The Parlour, a mass, other pieces for orchestra or chamber ensemble, and numerous songs, mainly for voice or chorus and orchestra. In 1949 she became the first British woman to score a feature film – Blue Scar. Grace Williams kept composing right up until her death of cancer in 1977, a few days before her 71st birthday. Grace Williams was known for her integrity and her modesty – she even turned down an OBE in 1966. She was an accomplished and versatile composer who managed to capture the heart and soul of Wales in her powerfully expressive music, and proved that it was possible to be a successful composer without having to live in London. Her music continues to be much loved and to inspire audiences and musicians both in Wales and further afield.